The Yamaha 660 is a larger, more capable vehicle than the Rhino 450. 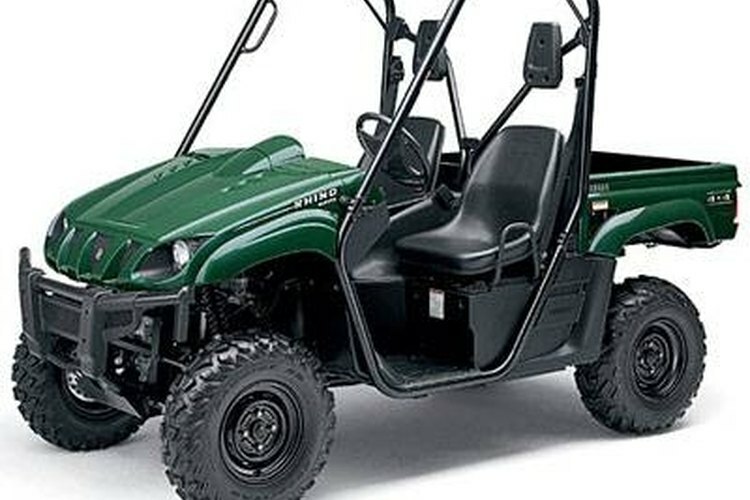 The Yamaha Rhino 660 is a cross between an off-road ATV and a souped-up golf cart. Able to go pretty much anywhere (thanks to its locking four-wheel-drive differentials) while carrying two passengers and an additional load, it's an impressive machine. The Rhino is driven by a 660cc, liquid-cooled five-valve engine coupled to a V-belt automatic transmission, and carries a punch you wouldn't normally expect in a vehicle of this sort. The Rhino gets most of its components and engine parts from the Grizzly 660 ATV, including the engine. The spark plugs constitute a component that can commonly go bad on ATV and off-road engines. Changing the spark plugs in the Rhino 660 may be a bit more complicated than doing so on a typical ATV; however, a novice mechanic can still accomplish this task by following the steps outlined here. Begin by removing the seat and engine shrouds. The engine is housed under the seat section of the Rhino 660. Use the screwdrivers to remove the shroud bolts that are holding the plastic shrouds on the engine, and use the ratchet to remove the seat bolts. Lift the seats and shrouds free of the frame and put the bolts in a cup for later use. Know that the Rhino 660 has a single cylinder with one spark plug. Locate the plug wire and trace it back to the top of the cylinder. This houses the spark plug; pull the plug wire straight up off the plug. Use the spark plug wrench to loosen the plug, then spin the plug out the rest of the way by hand. Examine the plug for fouling or burning, which could indicate the need for an engine tuneup. Use the spark-plug gapper to check the gap of the spark plug against Yamaha's recommendations. Adjust the gap accordingly, then screw the new spark plug in place finger-tight. Follow up by tightening the plug with the spark-plug wrench. Push the plug wire back into place on top of the spark plug, then replace the seats and the engine shrouds. Start the Rhino and take it for a test ride. Purchase your spark plugs from a reputable dealer or parts supplier. Get the manufacturer-recommended plugs to ensure that your engine stays strong and healthy. Heed the manufacturer's directions for gapping the spark plugs, as this prevents engine damage and increases gas mileage.